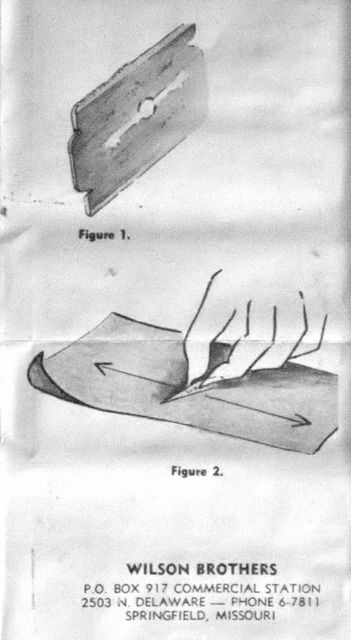 There are three fundamental techniques of paring leather in bookbinding: using a paring knife, using a modified spokeshave and using a paring machine, such as the Fortuna, Schar-Fix or Brockman. Often various combinations of these methods are used. Learning how to pare leather not only requires learning the technique of using a knife or spokeshave, but also the skills of how to keep the knife or blade sharp. 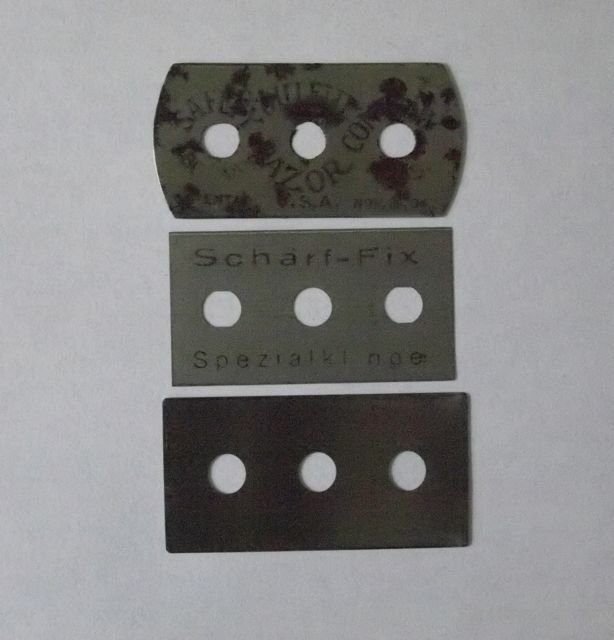 The Brockman or Scharf-Fix alleviates the need to learn how to sharpen, although some thrifty bookbinders do resharpen their double edge blades. 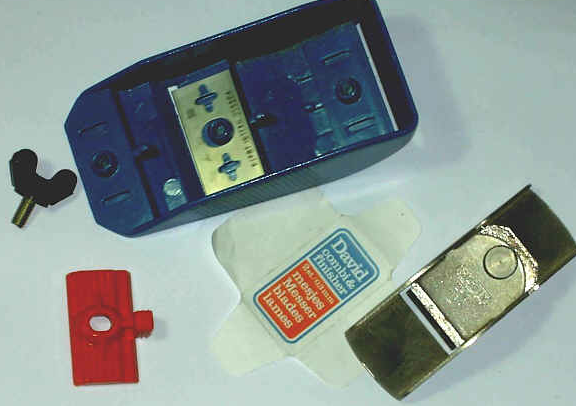 These paring machines are best suited for making small, thin flat pieces of leather — generally for onlays, labels, quarter bindings — rather than achieving a long, gradual bevel necessary for rebacking or English style full leather bindings. There is a fourth, somewhat obscure method of paring leather which uses a razor blade plane. There are numerous types of these planes, dating from at least the 1950’s until today. Originally, they seemed marketed to the home handyman, now most are marketed to model makers. But at some point in time, bookbinders discovered these planes. I’ve found little information about the history of using these planes on leather. Jim Craven, a bookbinder in Ann Arbor, Michigan, reports he recieved a Little Giant in the 1960’s, and is not sure when he started to use it on leather. 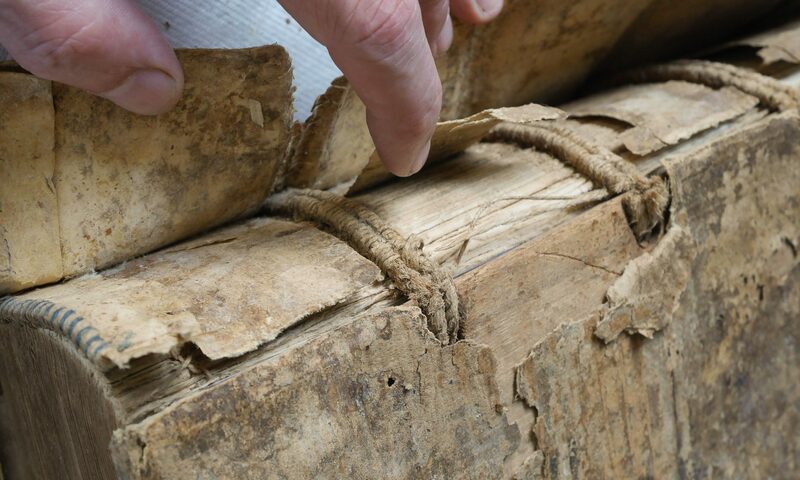 Judith Ivry, bookbinder and conservator, says they were somewhat of a craze in the 1980’s in New York City. Occasionally I meet a bookbinder who uses, or has used them. This post contains observations about these planes. American, German, Dutch and English versions are represented. 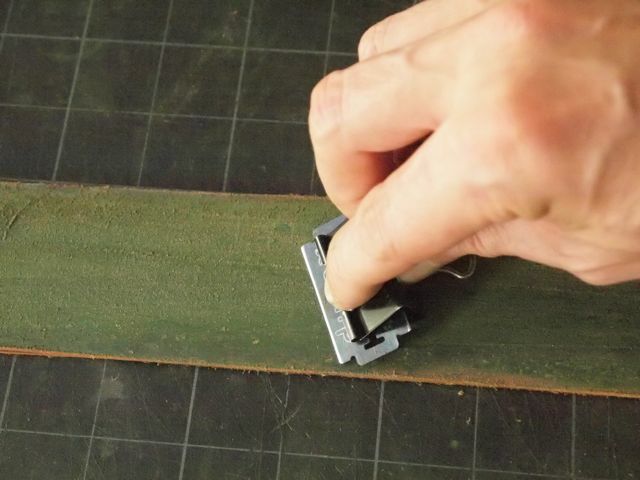 Next week, in part two, guest blogger Eric Alstrom, Head of Conservation at Michigan State University, will present some tips for using razor planers on bookbinding leather. This is one of the most common, and better made than most. As far as I have discovered, this is the first oxymoronically named tool. The logo is well done, consisting of a curious kneeling ‘little giant’ supporting its own name that is shaped reminiscent of a dumbbell. This logo is a registered trademark, and the plane I have has patent pending cast on it. The instruction sheet lists it registered with patent number 2,781,804, which was filed in 1955 and granted in 1957. I’ve seen at least two versions of the instruction sheet. The two planes come neatly boxed, one for curved surfaces and one for flat. The version with the flat sole is most suited to paring leather. 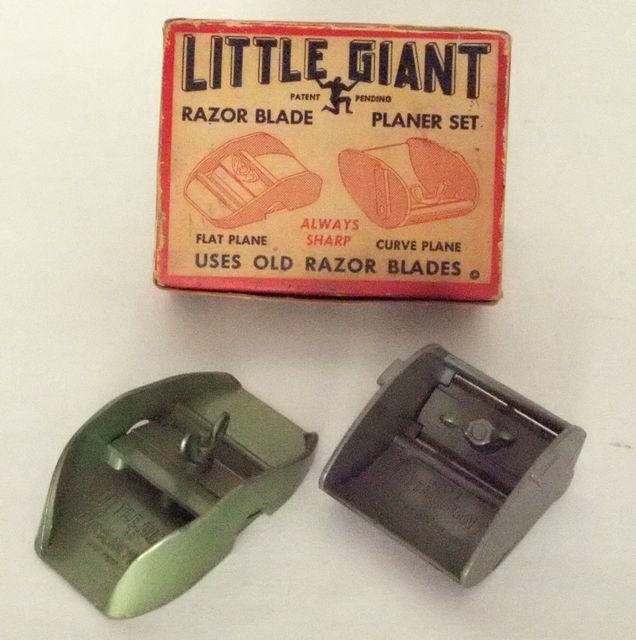 If you are curious about using a razor blade plane, the Little Giant would be my first choice. Mine functions reasonably well with no alterations. The Little Giant is manufactured to a higher quality, with a more precisely ground sole and overall more solid feel than other planes I have tried. 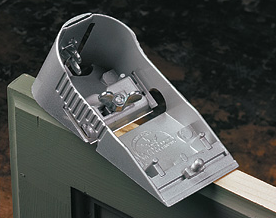 The flat model has a unique recessed finger area for positioning the angle and depth of the blade, while preventing fingers from making contact with the blade when planing. The curved model has two angles, one quite sharp, one more gradual, so the two planes can be used in three different planing configurations. 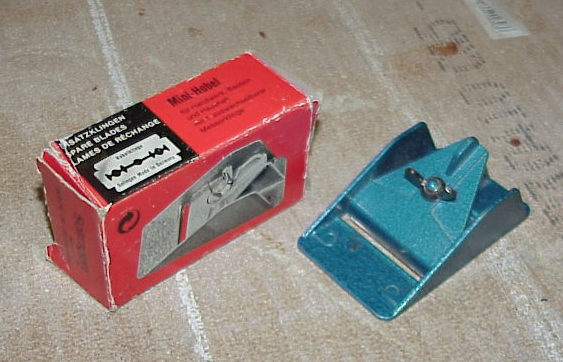 The box is printed, “Uses old razor blades” and the instructional sheet includes directions on how to resharpen double edge razor blades, although it is a bit difficult to understand how these very basic instructions could be of much help to a novice sharpener, especially one who had purchased a razor blade plane possibly in an attempt to avoid having to learn how to sharpen a blade in the first place. The finger position holding the blade looks frighteningly dangerous and seems to be putting a 45 degree bevel on the blade. 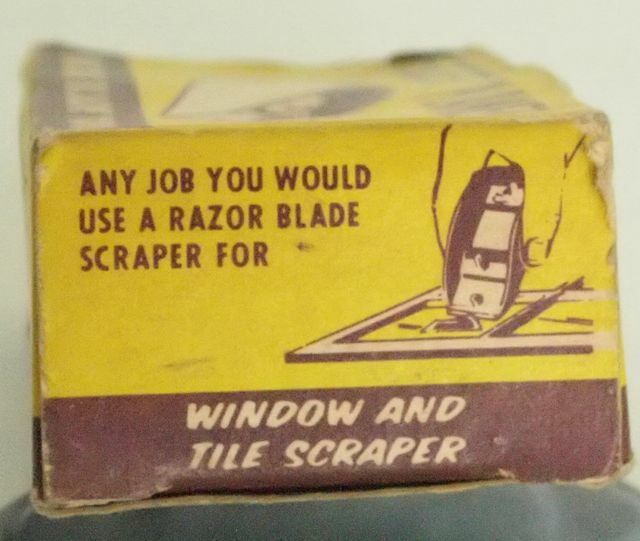 These sharpening instructions, from the late 1950’s, which accompany the Little Giant are perhaps the earliest illustration of the Scary Sharp sharpening method. They repeatedly mention using emory paper to resharpen double edge razor blades. But is Scary Sharp just using abrasives mounted on a paper of film substrate, or is it using a progression of these? 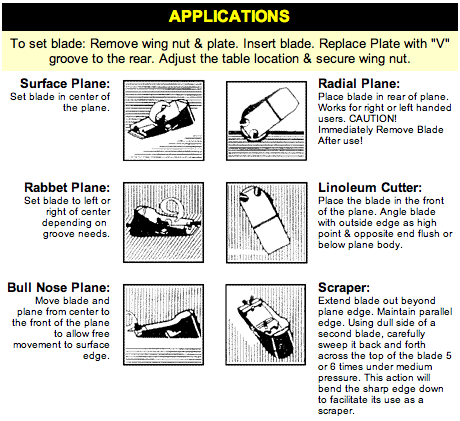 The informational sheet included with Little Giant planes shows three vignettes of the plane in use: a man trimming a door, a woman shaving down a drawer, and a boy making a model airplane. This is a tool not only for the man of the house, but the entire family. 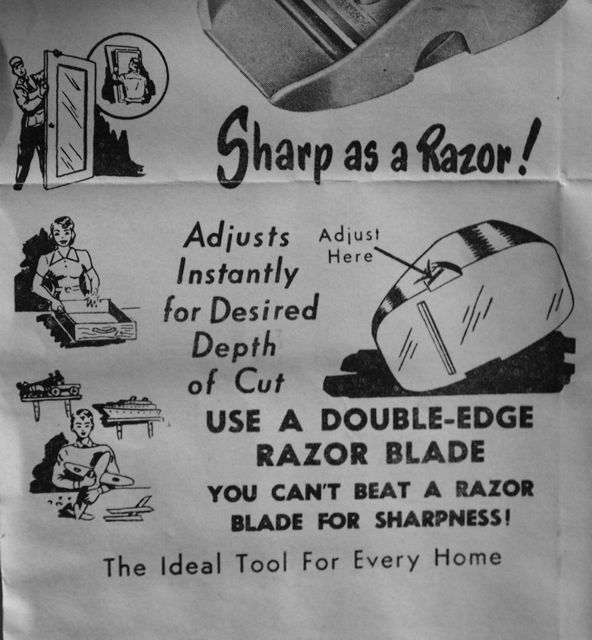 Note that it is advertised as being “sharp as a razor”. Yes,well, it is a razor. 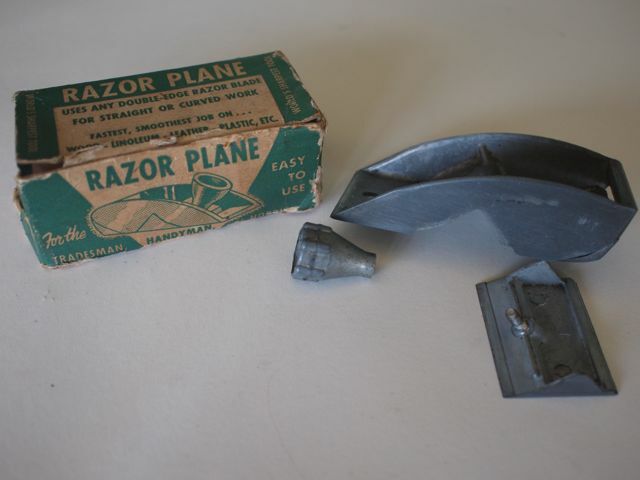 Roughly 75% of the razor blade planes I have found appear unused, in the original box. 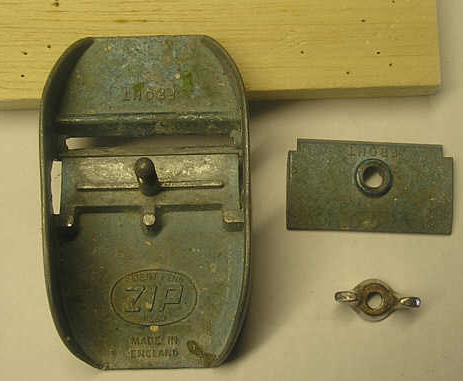 The presence of so many “NIB” razor planes also suggests that they were likely used, or attempted to be used once or twice, then returned to the box. Perhaps the few beat up ones without boxes — a rarity — will prove desirable to collectors. The Little Giant is the only plane that I have seen that was painted; there is a light green, a darker green, a blue, and some are natural aluminum or pot metal. 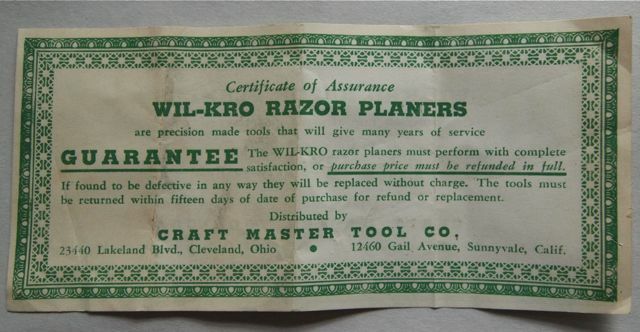 The Wil-Kro (sometimes spelled Wilkro, even on the original box) is the most commonly found razor blade plane, in my experience. It also works well in leather with little or no tuning. While some users may be content with the three blade configurations of a Little Giant, a Wil-Kro owner gets four: a flat sole, a bull nose, a chisel and a curved sole plane. It is one of the smaller razor blade planes, the most innovative in design, and quite comfortable to use. The blade depth is a slightly difficult to adjust on my examples, since the blade cap is actually part of the plane. A $2.50 price sheet is boxed with the model I have, although perhaps many enterprising home handymen took advantage of the discounted price of $72.00 for a gross! The small piece labeled “Fig. 8” below is often missing on planes I have seen for sale — examine the contents of the box carefully. 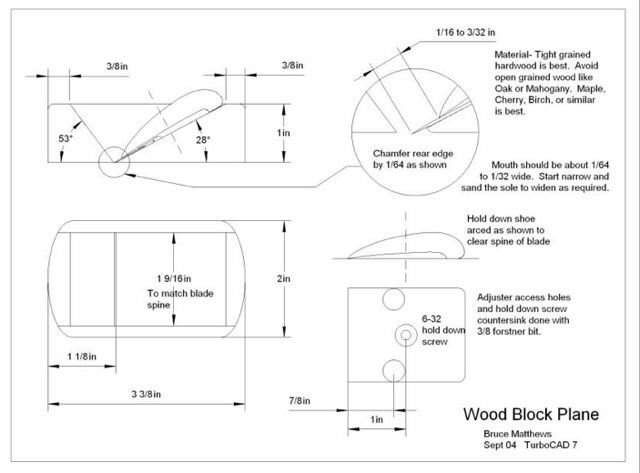 This piece is used in the plane configuration Figure 4 on the instruction sheet below, useful for wood, but not really for leather. Granted in 1942, the patent emphasizes many of the clever design features of the multipurpose handle which also secures the blade. This is the only razor blade plane I have that has the patent number stamped on the plane body, and it is the most innovative design. 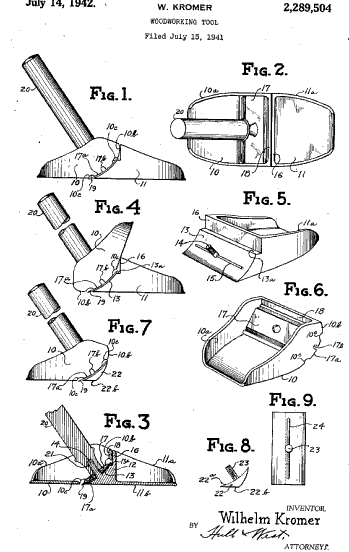 The patent application later notes that the blades are similar to the blades used in safety razors, but slightly different. In the instructions provided with the plane, however, ordinary double edge razor blades are recommended. The tightening knob evidently underwent some refinements during production, and has a much more elegant, almost horn like shape which is easier to align and tighten than the wing nut on all other planes. Since the body of these planes are essentially in two pieces, some users feel they are not as rigid as one piece models, though this does not seem to be an issue when using them on leather. The patent application describes this as a woodworking tool, which is perhaps its most ill suited use. The Wilkro came with fairly detailed instructions. The necessity for written instructions seems to indicate either a new or complex tool, or marketing to a realtively amateur market. Like the Little Giant, use in homes, possibly as a one plane fits all, seems to be the main focus for sales. Unlike the Little Giant, users of the Wilkro are advised to replace dull blades rather than resharpen them. Since the advertising I have found for both of these are roughly contemporaneous, I wonder if there was stiff competition between the two in the mid 1950’s? The plane also came with this Certificate of Assurance. It certifies that the Wil-Kro is percision made and will give many years of service. It then guarantees this performance for exactly fifteen days from the date of purchase. The overall size of this cerificate (152 x 71 mm) is almost exactly the same as a dollar bill (157 x 66mm) and the green ink and boarder decoration also seem to visually imply paper currency. 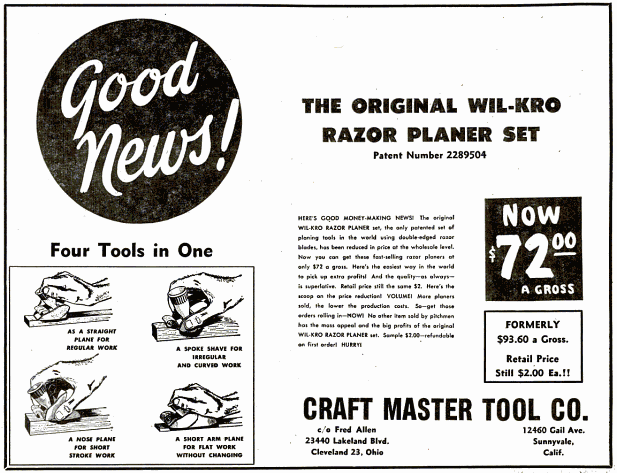 Most Wil-Kro boxes list “Craft Master Tool Co.” as the manufacturer and the contact for the warranty. One box I have, however, does not include a warranty and lists “Winston Sales Co.” as the manufacturer on the outside. Otherwise the boxes are identical. The Select seems to have undergone at least three packaging styles, and one major redesign. I think the version pictured above is earlier than the ones below. 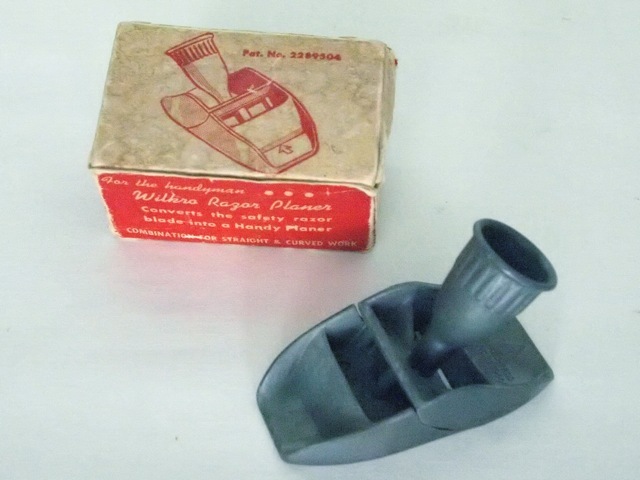 The packaging is similar to the Wilkro: the company information on one end of the box is almost identical in layout, the “horn” tightening nut is similar, and even the complex shape to the blade holder all recall the Wilkro. In this version, the chisel blade position at the front is functional, later it is abandoned. The complex flat blade holder design is also simplified in the versions below. The distinctive outward flair to the sides of the plane remain constant, however. This is a somewhat interesting tool, the example I have has two different blade configurations, a flat and curved located at the back of the plane. 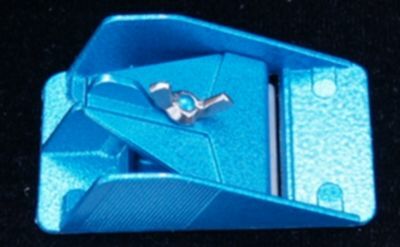 The instructions, located on the side of a bag containing blade caps and wing nuts, show two different types of assembling the plane. The box states the plane is for “Tradesmen, handymen, hobbyists, housewives.” Like the Little Giant, somewhat early marketing towards women. This plane feels distinctly larger than the previous two, and doesn’t seem to work quite as well on leather. On one end of the exterior box the plane is shown operated a third way, like a scraper or chisel plane. The plane itself seems to have a vestigial place for a stud. But is it broken, did someone removed it, or were there manufacturing difficulties? Made in USA, no patent. There is a nice slideshow of this plane on Howies Antiques, showing the same lack of a front scraper attachment. The packaging advertises it it useful in wood, plastic, leather, rubber tile, linoleum and pressed wood. To me, this one looks later than the Wilkro or Little Giant, perhaps even 1970’s? 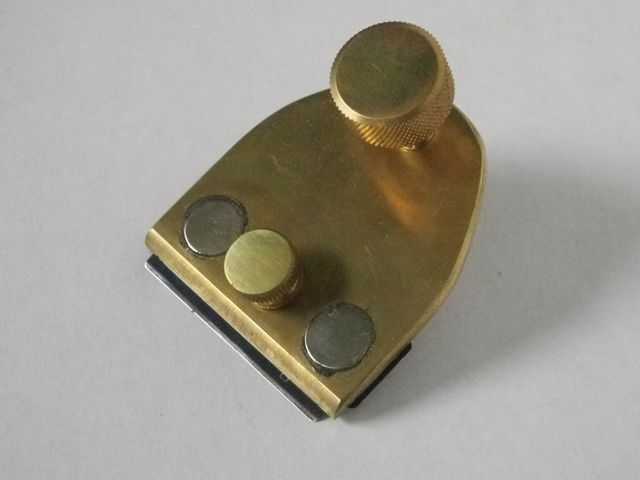 Another version of the Select, with ribbed finger grips on the side and a fancier knob was also made. This is the earliest razor plane (if it uses a disposable razor blade) I have seen. Also the only one made from cast iron, the owner reports 3 5/8″ long, 2″ wide. This is a very common size for most razor blade planes. I’m unclear how the blade clamping mechanism might work. 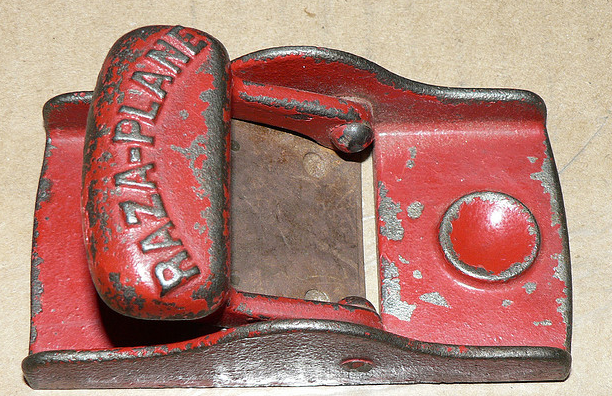 There is a general thread about razor blade planes in the Old Tools Archive. Made in England.The blade looks pretty easy to adjust from the sides. Marked Patent Pending. Like the Wil-Kro, the proper direction for planing is cast into the plane, which to me indicates a very low expected competence from users. Dutch. 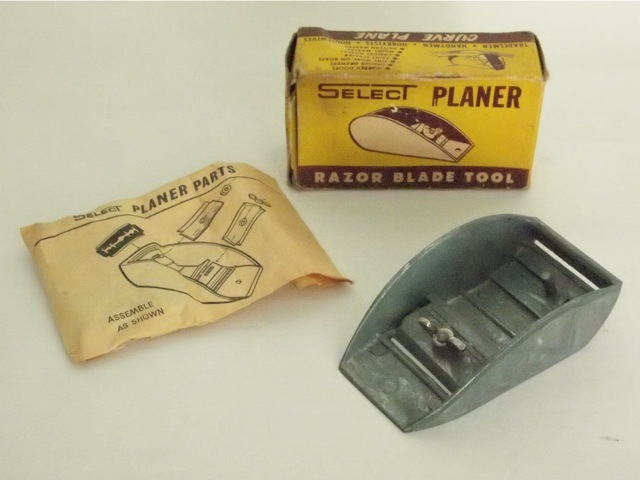 Often regarded as one of the better old razor planes by model airplane makers. 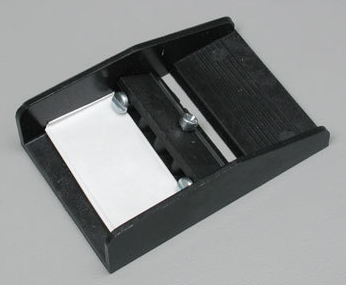 Three blade positions, and uses a wing screw rather than a wing nut. The 45 degree chamfer at the end, when the blade is in a chisel position, let the blade be used as a knife. The sole may have too much surface area to work well on leather. Reportedly there is a plastic piece that deteriorates relatively quickly. The David is for sale at sky king rc products. German? This tentatively identified plane is perhaps the most elegant and ergonomic in form, to my eye. It functions as a flat and chisel plane. It looks quite comfortable to grasp, and the blade is accessible from three sides for adjustment. German. 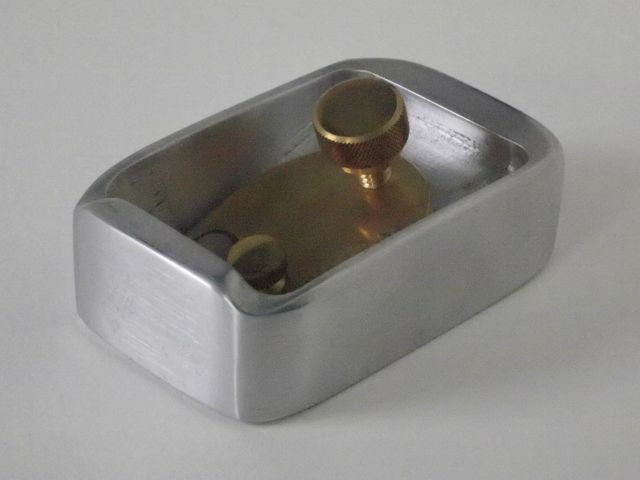 I’ve also seen this called the “Amati model ship planking razor plane“. Geometric styling. 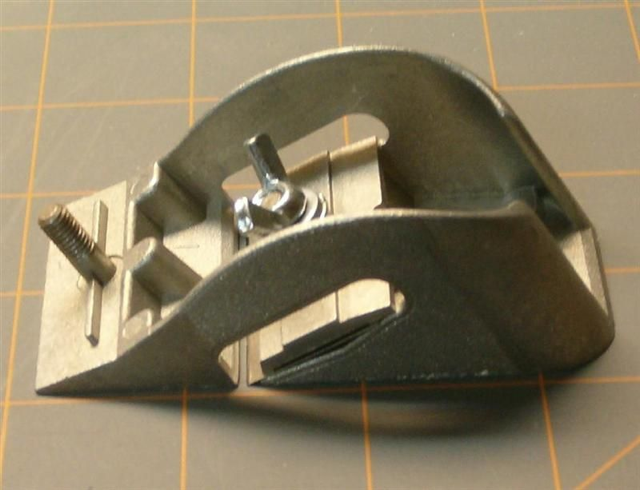 The blade cap appears to rest on a cast stand, possibly concentrating pressure on the front edge, similar to ‘real’ planes. The description claims this makes the blade rigid enough to plane across the grain, as well as with it. This raised area at the end of the blade cap may protect the users hand from jamming into the wing nut. The mouth on this one looks rather large for use on leather. Available from A2Z Corp.
Perhaps the most basic design imaginable. These are available from many retailers and seem to be the preferred new model among model makers. Simply designed. They use a proprietary double edge blade which is very thick at .017″ — most double edge razor blades are .oo4″-.008″. The two screws behind the blade seem to adjust depth and angle, which would make replacing the blade to the exact cut as the previous one much easier, though I wonder if the screws might damage the blade edge? The mouth looks too big to work well on leather. The Lee Valley is made in Germany, and has a rear handle that doubles for planing curved surfaces which is perpundicular to the usual planing position. The wingnut to tighten the blade is visible on the back of the handle. The consensus among woodworkers is that the plane is useful for basa wood, and maybe other some very soft woods, but not as a general use plane. It features three variable positions, normal use, as pictured below, as a chisel plane with the blade at the front, and curved at the heal. Having a blade potentially positioned right on your hand seems like a poor design choice. Lee Valley advertises it as a plane to use when you don’t want to use your good plane, like on paint. The sole may have too much surface area to work well on leather. The swiss army knife of razor blade planes with six functions. No image found, but looks the same as the plane Lee Valley is selling. According to the manufacturer, uses special ice hardened blades at a bed angle of 27 degrees. Some discussion about it from the Hip Pocket Aeronautics Builders Forum. The promise of not having to sharpen or resharpen these razor blade planes may account for their continuing appeal, as does their simple, unthreatening and lightweight nature. Most of the packaging emphasizes their easy multi-functionality, appealing to a home repair/ hobbyist crowd. In fact, the packaging is possibly as interesting as the planes are. Even though the general consensus among users is that they don’t work nearly as well as their advertised purposes, there have been many variations of these planes over the past 50+ years and several are still in production. Although these planes barely function on most types of wood, they are much more functional in soft materials, including leather. The combination of their curved blade bed, very low effective blade angle, the off the shelf sharpness of razor blades and small sole area prevent excessive stretching of leather that can occur with more standard block planes.There are also many types of small planes with normal blades: block planes, miniature planes, musical instrument planes and spokeshaves, toy planes, Stanley 12-101 trim plane, Lie-Neilson model makers plane and 102 block plane, Veritas Apron plane, etc…. None that I have tried work very well on leather, primarily, I think, due to inappropriate effective blade/ bed angles, excessive friction from the soles that causes the leather to stretch, buckle or tear, and clogging of the mouth. 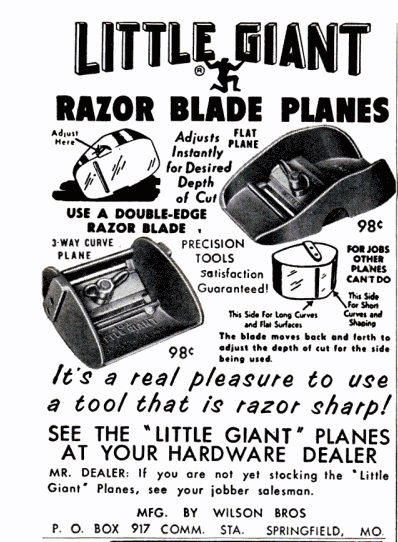 I find razor blade planes interesting not so much because they are exemplars of the toolmakers art, but because they are emblematic of the post-WW2 home handyman boom, the creation of suburbia, 1950’s advertising and other societal aspects. The packaging also reflects a change in tool marketing from primarily a male activity, to a family one. Tool snobs may consider these types of planes closer to toys than tools – and they may be right – but they are all tiny pieces of the total picture that inform our understanding of tool use as a fundamental human activity. 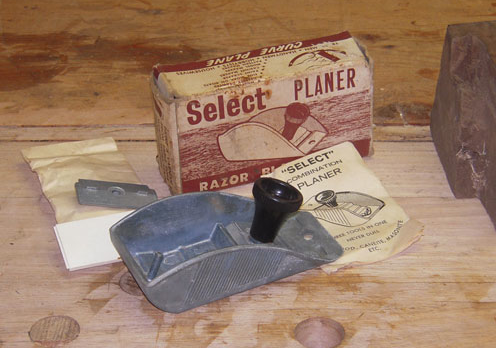 Next week : Razor Blade Planes: Tips on Using Them to Pare Leather.